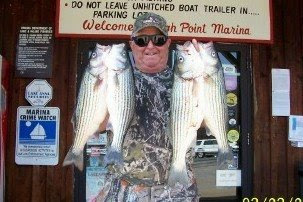 Last night Lake Anna lost one of its most well liked and revered fisherman and resident, Striper Fisherman Doug Ball. Doug's laughter and Jolliness will be missed but not forgotten. We would like to express our deepest sympathy to his family and friends. I had the pleasure of fishing with Doug in March, along with a couple of buddies. Although I never had the pleasure of knowing him well, I could tell he was a kind and humble soul, a patient teacher, a great fisherman, a gentleman, and all around good guy and grandpa. He said he had been married to his high school sweetheart for 50 years - something that we all congratulated him for! We had a great time, so great that we were already planning return trips with our girlfriends and wives and looked forward to many more days in his company. It is with sadness that I found out about his passing, while looking to book another trip. I know that there are many who knew him better than we did, but we still send our prayers and condolences to his family. I met Mr. Ball about 8 years ago on Lake Anna one summer when we rented a house on the same cove where he lived. I stopped him one night and asked him about the lake and the fishing. We talked for an hour or two about fishing and life in general. Mr. Ball was a good people and I'm happy to have known him. My sincere condolences to his family.